Successfully Added 1GB Mini MP3 Player - Voice Rec + Built-In Speaker to your Shopping Cart. Very small format metal body MP3 Player. 1GB Flash memory. Blue backlit LCD display. Voice recording with built-in microphone. Built-in mini speaker. FM Radio. Standard 3.5mm audio jack - earphones included. 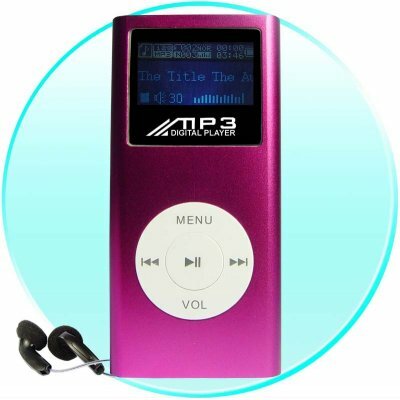 This wholesale MP3 player is as simple as plug and play. Colours available- pink; black; silver: Please specify the colour(s) you require using the comments box in the online checkout process..
Power Source: Built in Rechargeable Polymer Lithium Battery - Plays over 4 hrs on one charge. Charge via USB. If you wish to make comments or reviews about this product, please use the product review. Please open an enquiry ticket if you have questions..